A UNIQUE DEPTH OF KNOWLEDGE, bringing business expertise with over 60 combined years of experience. FEARLESS HONESTY because communicating the truth is not always easy. RESPONSIBILTY to his company, his team, his family, and his clients! RESULTS, which are the effect of mutual, long-term partnerships with clients. Financial planning doesn't happen by chance; it is the product of sound decision-making. Whether you are looking to protect, grow or transfer wealth, as a Wealth Management Advisor, Josh Parish can help. He understands the complex financial issues and the ways in which these issues might affect your future. Financial planning requires a commitment of time—yours and that of your financial planner. Josh will work to understand your current personal and financial circumstances and your goals for the future. He will work to do more than determine a planning solution. He will build a strategy that is right for you. Together, you will work to develop a financial plan that balances your short-term needs with your long-term goals. And Josh will stay in touch, so as your needs evolve over time you can make the changes necessary to protect your overall financial picture for the future. Let Josh help you ensure your financial future is all you want it to be. 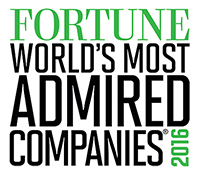 Northwestern Mutual is among the "World's Most Admired" life insurance companies, according to FORTUNE magazine's annual survey, published February 19, 2016.